Washington, DC - Here’s something likely to make consumers start firing on all cylinders: receiving an “URGENT RECALL NOTICE” in the mail with a “warning” that their vehicle “may be under an important factory/safety recall.” But according to an FTC lawsuit against the Passport group of car dealerships in the Washington, D.C., area, the vast majority of people who received those notices didn’t have a vehicle subject to an open recall. The complaint offers object lessons about a marketing campaign that took a seriously wrong turn, resulting in settlements with the dealerships, Passport’s president and vice president, a marketing firm, and the firm’s CEO. According to the FTC, in November of that year, California-based Temecula Equity Group, also known as OverflowWorks.com, a direct mail and digital marketing firm that regularly works with members of the auto industry, approached Passport with a sample promotion: a bright red mailer with white capital letters announcing an URGENT RECALL NOTICE. With Passport’s approval, Overflow added Password’s name and address to a template and sent the card to 6,920 Toyota owners who lived nearby. As the complaint alleges, the defendants didn’t act in response to a specific Toyota recall and made no effort to send the mailing only to consumers whose cars were being recalled. Ultimately, Passport started to get complaints from consumers and – in the words of Passport’s vice president – “a ton of heat from Toyota.” But despite that heat, the VP allegedly remarked to other Passport managers that the promotion had generated “410 unique callers.” Nor did the heat dissuade the company from continuing to use similar tactics. You’ll want to read the complaint for details of another mailing of those “urgent recall notices” to 14,491 Nissan owners in the area. In that promotion – the genesis of which was a Nissan “voluntary service campaign,” not a recall – the FTC says the majority of consumers who got the notice didn’t have a vehicle subject to the campaign, let alone subject to an open safety recall. The FTC complaint charges that the defendants represented that people who received the notices had vehicles that were subject to an open safety recall – a claim that in many instances was flat-out false. The proposed settlements with the Passport dealerships, company president Everett A. Hellmuth III, vice-president Jay A. Klein, OverflowWorks.com, and its CEO Jeffrey R. Bush prohibits any misrepresentation about whether a vehicle is subject to an open safety recall or service campaign or any other misrepresentation regarding a material fact about a vehicle’s safety, recall status, or servicing. What points should this case drive home to other businesses? Don’t depend on an “Inc.” to shield individuals from liability. There are lots of good reasons to incorporate your business, but sidestepping FTC enforcement isn’t one of them. In appropriate circumstances, the FTC can name individual corporate officers in their individual capacities. The settlement with Passport’s president and vice president illustrates that principle, as does the action against Overflow’s CEO. Attention marketing professionals: Truth in advertising applies to you, too. The scope of the FTC Act is broad. Depending on the facts, ad agencies and marketing firms may be responsible for their role in campaigns that violate the law. Put the brakes on any promotion that deceptively implicates recalls or safety. The safety recall system is in place for one reason: to save lives. 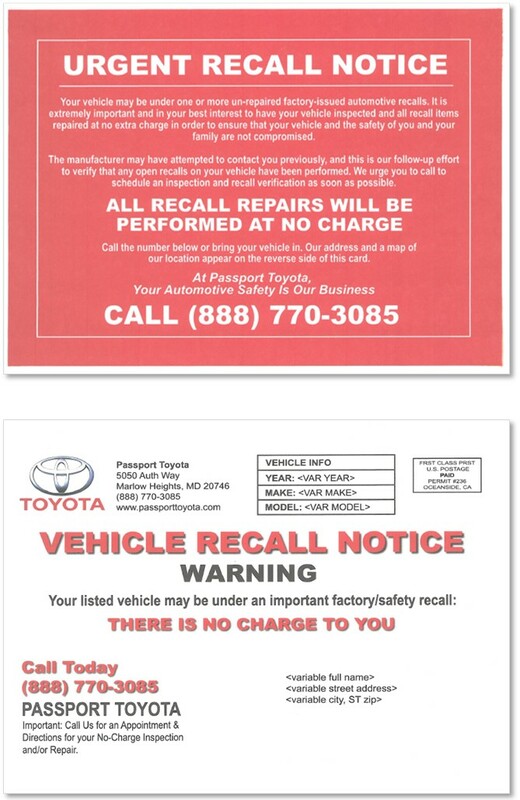 Marketing materials that mimic the look of recall notices harm consumers because they can sow the seeds of skepticism about real recalls. Car owners should take action when they receive recall notices from manufacturers. And dealerships are encouraged to look out for their customers by helping to spread the word about legitimate recall campaigns. But exploiting consumers’ safety concerns to “cultivate business and get the phone to ring”? That’s a double yellow line no dealer should cross.